The end of the world didn’t happen overnight. After years of societal breakdowns, wars and quakes and rising tides, humanity was already near the edge. Then came a final blow no one could have expected: all the world’s corpses rising up to make more. Born into this bleak and bloody landscape, twelve-year-old Julie struggles to hold on to hope as she and her parents drive across the wastelands of America, a nightmarish road trip in search of a new home. Hungry, lost, and scared, sixteen-year-old Nora finds herself her brother’s sole guardian after her parents abandon them in the not-quite-empty ruins of Seattle. And in the darkness of a forest, a dead man opens his eyes. Who is he? What is he? With no clues beyond a red tie and the letter “R,” he must unravel the grim mystery of his existence—right after he learns how to think, how to walk, and how to satisfy the monster howling in his belly. Some years ago, I remember loving Warm Bodies enough that I recommended it to most everyone I know who reads. When I found out that its author Isaac Marion released a novella, I wanted to find a copy of it here in the Philippines–but I never did. So, when I got a copy of Warm Bodies‘s actual sequel, I decided to buy the novella off Amazon. I’m not sure how important this novella is going to be once I read The Burning World, but I have this to say: The New Hunger does not have anything that I loved about Warm Bodies. Yes, the characters are the same. But that’s where I think the biggest problem of the novella stems from: it’s the same. Nothing’s new. The only thing that makes it different from Warm Bodies is the fact that the characters haven’t met each other yet. And while, at the very least, we get some action from the chapters featuring Nora. The ones that follow Julie and ‘R’ are especially dull: there’s no threat, there’s no development–they’re just moving pieces filling time until something bigger happens. When I first read that there was going to be a novella that serves as a prelude to Warm Bodies, I had hoped it would make the book’s world richer–it did not. It felt like a money-grab for fans of the movie who want something new to sink their teeth into after watching the film. I hope The Burning World, the actual sequel, isn’t anything like this novella. It’s funny how, almost two years ago, I couldn’t imagine the book being turned into a film–much less a film worth recommending. But that’s just what happened. Summit has made a good movie. What I really liked about Warm Bodies was how it was trying to change the zombie genre. But, as I said, I couldn’t imagine how the people behind the film would translate that. What we end up with is a romantic-comedy sort of film. And it works. 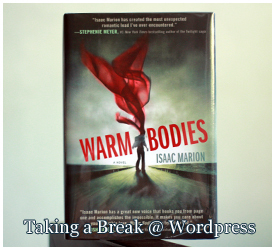 Warm Bodies, in essence, is a Romeo and Juliet story. You have two factions, and a love that was as much impossible as it was inevitable. But it happens. And the film captures this, and celebrates this. So much so that we actually get a balcony scene between Juliet and R which I found really hilarious. Though, much as Nicholas Hoult and (a strangely plain) Teresa Palmer do great in their roles, it’s actually Rob Corddry and Analeigh Tipton who steals the film for me. They are awesome and hilarious–and they hit the right notes. Especially Analeigh Tipton. This is, I think, the first time that a movie version of a character made me like a book character that I didn’t really notice. And now that I love Nora, I’m very much looking forward to the paper book version of Isaac Marion’s The New Hunger which makes Nora a bigger character than she is in Warm Bodies. Before I move on to the other things I liked about the film, I want to bring this up: what happened to Teresa Palmer? I’ve seen her in I Am Number Four, in Bedtime Stories–and she looked hot. So why does she look like a blonde Kristen Stewart in this film? That’s not a good thing, let me tell you. What I like best about Warm Bodies the film is the subtle things they incorporated–especially with R’s character. Something is changing in R. As per the synopsis, he’s increasingly becoming more human. And the make-up department does wonders with their gradual change of his skin tone. Nicholas Hoult also does well with the slow subtle changes he puts into his character–like the fact that he’s always slouching in the beginning of the film, and starts to stand up straighter as he turns more human. R’s asides in the book fit nicely with the voice overs for the film. And I like how there are four different looks for the film: the blue-gray tint of the zombie ruins, the harsh lighting of the survivor camp scenes, the toned-down and yet vibrant colors of memories–and the warmer colors of the ending scenes. This is a great use of color-grading, I think. Something I hope the makers of Tiktik take notice of when they get to the post production of their sequel. Overall, the movie is a must watch. It’s not perfect, but it’s totally worth the ticket price. “R is a young man with an existential crisis—he is a zombie. He shuffles through an America destroyed by war, social collapse, and the mindless hunger of his undead comrades, but he craves something more than blood and brains. He can speak just a few grunted syllables, but his inner life is deep, full of wonder and longing. He has no memories, no identity, and no pulse, but he has dreams. Warm Bodies is a book about zombies. For some reason, someone thought it was a good idea to ask me to write a review about the book. That was a few weeks prior to the book’s release, I think. Or maybe it was just a week. Sadly, because of logistical reasons, we determined that it wouldn’t be possible for me to receive an advanced copy to read and then write about. But the contact had been made—and I was already intrigued. When the book eventually came out and I saw a copy of it at a local bookstore, I decided to pick it up. Book-blogging friends have heard (or read, as the case might be) nice things about the book, and they said as much. So as soon as I wasn’t drowning in work, I started to read. A few hours later, I finish reading. And now I’m here to tell you, I love Warm Bodies. Warm Bodies, like Rot & Ruin, brings another game-changer to the world of zombie fiction. If Rot & Ruin emphasizes the human past of zombies, Warm Bodies takes it up a notch higher—and makes zombies humane. R, our main character, has been a zombie for quite some time when we meet him. He doesn’t know for how long, and we don’t really get a clue as to when the events of the novel do happen. But it doesn’t matter. Time doesn’t matter for a zombie. That is, until he meets Julie, our female protagonist. And then, things change for R.
The pace of the book’s story-telling is reliant on R’s thought-process. Things are laconic as R sets up his world for us, while we grasp at this new world we’re being introduced to. And as soon as he meets Julie, things become more effusive. There doesn’t seem to be enough words to describe the wonderment of Julie. And it seems just right for this to happen, as R and Julie’s meeting is the catalyst that triggers the change sweeping through the novel’s world. Isaac Marion, the author, gives a new twist to the mythology for zombies. A little bit. Like in Rot & Ruin, anyone who dies is instantly turned into a zombie, and no one knows what caused this to happen; but while Rot & Ruin maintained the rest of the mainstream zombie beliefs: that zombies are driven by their hunger for human flesh, and that they don’t think—much, Warm Bodies give it an all-important twist. Those with a brain intact can produce thought. And there are worse things than zombies—the Boneys. This, I think, is the first time I’ve encountered a sort-of caste system for zombies. But then again, is there any twist bigger than the novel’s premise: a zombie that thinks! It’s a very novel concept, one that can be stretched through many books—which, I’m happy to say, it doesn’t. Though, I also have to add that I did worry how the author was going to wrap up the story with only a few pages remaining. I think he did well. The ending wasn’t perfect—but it wasn’t a disappointment. Everything was pretty much set-up from the very beginning. And while I did say I’m happy that the story ended here, I wouldn’t mind taking another visit to this universe if the author does decide to set another story in this very different post-apocalyptic world—where zombies think, and feel, and love. Warm Bodies (hardcover) is available at Fully Booked for PhP999. I’ve yet to see a copy in National Bookstore or Powerbooks.